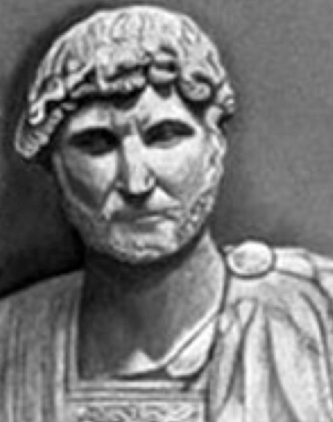 Publilius Syrus is a famous Poet from Syria, he is still alive and was born . Publilius (also known as Publius Syrus (Publius Syrius) Publilius Sirius or Sirius Publius) was a Syrian poet and writer, active in Rome during the first century BC after being brought in as a prisoner. He was a native of Syria and was made ​​a slave and sent to Italy, but thanks to his talent won the favor of his master, who freed and educated. His pantomime, in which he acted, were very successful in the Italian cities and in games of Julius Caesar in the year 46. C. Publius was also a great improviser and received the prize in a competition Caesar in which defeated all his rivals, including the famous Tenth Laberio. As of 1911, the best texts of the Sentences were those of Eduard Wölfflin (1869), A. Spengel (1874), and Wilhelm Meyer (1880), with complete critical apparatus and index verborum; editions with notes by O. Friedrich (1880), R. A. H. Bickford-Smith (1895), with full bibliography; see also W. Meyer, Die Sammlungen der Spruchverse des Publilius Syrus (1877), an important work. Our collection contains 61 quotes who is written / told by Publilius, under the main topics: Happiness, Dad, Forgiveness, Money, Wisdom. "No man is happy who does not think himself so"
"From the errors of others, a wise man corrects his own"
"If you wish to reach the highest, begin at the lowest"
"The wounds of love can only be healed by the one who made them"
"Admonish your friends privately, but praise them openly"
"Some remedies are worse than the disease"
"Each day is the scholar of yesterday"
"It is not every question that deserves an answer"
"The judge is found guilty when a criminal is acquitted"
"The bare recollection of anger kindles anger"
"It is a bad plan that admits of no modification"
"He whom many fear, has himself many to fear"
"A hasty judgment is a first step to recantation"
"You are in a pitiable condition if you have to conceal what you wish to tell"
"It is folly to punish your neighbor by fire when you live next door"
"He who lives in solitude may make his own laws"
"The timid man calls himself cautious, the sordid man thrifty"
"Good health and good sense are two of life's greatest blessings"
"Audacity augments courage; hesitation, fear"
"To refuse graciously is to confer a favor"
"An angry father is most cruel towards himself"
"How unhappy is he who cannot forgive himself"
"Reprove your friends in secret, praise them openly"
"Prosperity makes friends, adversity tries them"
"It is better to learn late than never"
"God looks at the clean hands, not the full ones"
"Count not him among your friends who will retail your privacies to the world"
"Art has a double face, of expression and illusion, just like science has a double face: the reality of error and the phantom of truth"
"An angry man is again angry with himself when he returns to reason"
"A beautiful face is a mute recommendation"
"Where there is unity there is always victory"
"The happy man is not he who seems thus to others, but who seems thus to himself"
"The eyes are not responsible when the mind does the seeing"
"It is a good thing to learn caution from the misfortunes of others"
"It is a fraud to borrow what we are unable to pay"
"He who spares the bad injures the good"
"He who has lost honor can lose nothing more"
"Fortune is like glass - the brighter the glitter, the more easily broken"
"A gift in season is a double favor to the needy"
"We are born princes and the civilizing process makes us frogs"
"Powerful indeed is the empire of habit"
"Let a fool hold his tongue and he will pass for a sage"
"It is only the ignorant who despise education"
"While we stop to think, we often miss our opportunity"
"We die as often as we lose a friend"
"Valor grows by daring, fear by holding back"
"Treat your friend as if he might become an enemy"
"One is not exposed to danger who, even when in safety is always on their guard"
"I often regret that I have spoken; never that I have been silent"
"Do not despise the bottom rungs in the ascent to greatness"
"When you confer a benefit on those worthy of it, you confer a favor on all"
"Take care that no one hates you justly"
"Speech is the mirror of the soul"
"No one knows what he can do until he tries"